ENCINITAS — Have you seen political campaign signs at some homes throughout Encinitas already, and wondered if isn’t it a bit early for the signs to be posted? It is earlier than years past, but it’s legal, city officials said. A new city policy that the council adopted in March allows for property owners to post up to two campaign signs on their property at any time, a major shift from the former policy which restricted campaign signs to a 33-day window — 3o days prior to and three days following an election. City officials clarified this recent change to its interpretation of the city’s sign ordinance in a “frequently asked questions” sheet it released Wednesday afternoon. The city’s action was prompted by number complaints about the seemingly premature appearance of signs promoting Catherine Blakespear’s campaign at more than a dozen homes. The FAQ sheet asks “what campaign signs can I post outside the 30 day period?” The answer: “On residential property, with the property owner’s permission, temporary signs (campaign or otehr noncommercial message) are allowed subject to certain limitations.” The city then gives the restrictions, which limit the height, number and duration the signs can be posted, six months. The change occcurred with little fanfare at a March 19 city council meeting, when the Council amended its political sign ordinance to allow other so-called “noncommercial” message signs to be erected during the election season. The amendment was supposed to put the city’s code in line with case law to allow all signs — as long as they weren’t signs for commercial purposes such as for real estate or to promote sales — to be allowed during election season. Earlier this week, however, at least one council member said the decision in March went further than that. Lisa Shaffer said it changed the way the city interpreted other portions of its code dealing with signs, including one that allows for the message of a sign to be changed without city approval, and another that allows temporary signs to be erected on residential properties for six months. “Until this point, we had different sections of the code to deal with different types of signs, but we were told that the city can’t restrict the content of the signs,” said Councilwoman Lisa Shaffer, who addressed her point of view on the topic in her weekly newsletter. The city determined that Muir’s and Stocks’ signs went up before they legally should have, after the duo were caught on video prematurely putting up signs. Three other candidates also had signs up too early, but none of the five candidates received any punishment. Some critics are concerned the change will lead to the proliferation of the signs – which some see as a nuisance — well in advance of elections. 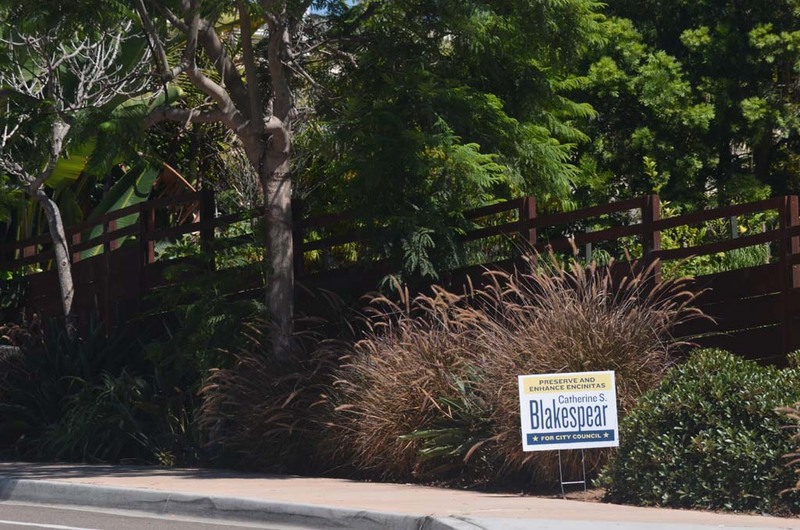 Pam Slater-Price, a former county supervisor and Encinitas councilwoman was one of the people who contacted The Coast News about Blakespear’s signs. She said she doesn’t understand why the city would deviate from its previous restrictions, which mirrors other cities across the county that limits the duration when campaign signs can be erected. While some cities, like Chula Vista, San Marcos, Escondido, Carlsbad and Vista, do restrict the time campaign signs can be erected, some cities mirror Encinitas’ new measures. Santee, for example, does not have any restrictions on when homeowners can erect signs and allows them to put up three such signs. 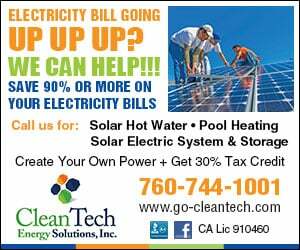 Both of Encinitas’ coastal neighbors Solana Beach and Del Mar, as well as Coronado, also allow homeowners to put up signs at any time. San Marcos also has similar sign regulations to Encinitas’. This post has been updated to reflect the city’s position on campaign signs.